Weknow.ac is malware or malicious software. It is basically a program that can hurt your Mac. This particular malware is a fake search engine (www.weknow.ac). It may look innocent but we know.ac records your activity without your permission. On your computer, weknow.ac is probably installed via a fake Adobe Flash update. A fake Adobe Flash will install this. It targets Safari, Mozilla Firefox, and Google Chrome. The way it operates is to hijack your browser settings and then to change your default search engine to https://www.weknow.ac without your participation. If you have this. You definitely should remove it. 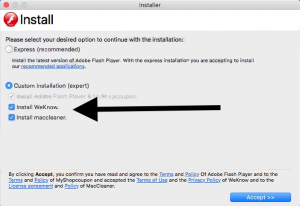 This article explains how you can uninstall the weknow.ac malware. Please pay special attention what you install. As you can see below, read carefully what is being installed. It is not easy to completely remove this but it is possible. During the steps, please note that if you see these names anywhere (MacSaver, MacVX, MacVaX, MacCaptain, MacPriceCut, SaveOnMac, Mac Global Deals or MacDeals, MacSter, MacXcoupon, Shop Brain, SShoP Brain, PalMall, MacShop, MacSmart, News Ticker Remover, Shopper Helper Pro, Photo Zoom, Best YouTube Downloader, ArcadeYum, Extended protection, Video download helper, FlashFree, GoldenBoy, Genieo, Inkeeper, InstallMac, CleanYourMac, MacKeeper, SoftwareUpdater), remove them. Delete this profile (AdminPrefs) by pressing the minus icon. 2-Delete weknow.ac. Remove anything weknow.ac related. Remove anything suspicious apps to the Trash folder. Look for recently added apps. Delete Weknow.ac or Weknow.ac.app also look for “MPlayerX”,“NicePlayer”. Look for suspicious apps. Google Chrome: Go to chrome://extensions/ and find the weknow.ac addon and remove it. Firefox: Go to about:addons and remove the addon. Look for suspicious files such as “installmac.AppRemoval.plist”, “myppes.download.plist”, “mykotlerino.ltvbit.plist”, “kuklorest.update.plist”. Some other names you should look for Genieo, Inkeeper, InstallMac, CleanYourMac, MacKeeper, SoftwareUpdater, MplayerX, NicePlayer, installmac.AppRemoval.plist”, “myppes.download.plist”, “mykotlerino.ltvbit.plist”, “kuklorest.update.plist, com.aoudad.net-preferences.plist”, “com.myppes.net-preferences.plist”, “com.kuklorest.net-preferences.plist”, “com.avickUpd.plist”. If you see any of them, drag them to the Trash folder and then empty Trash. Please note that the developers behind weknow.ac are very sneaky and they will likely further develop this malware so this means that those tips may not work in near future. We will try to keep updating this posts. You may also want to install and run MalwareBytes. This is the only thing that helped,I have no way to be sure that this crap is not luring in the backgrund though… Thanks a lot guys! Finally, I remove it! Thank you so much! I did everything here, it didn’t work. After searching the internet for a week and trying everything to remove weknow.ac, I followed your steps carefully and finally got rid of it. All other sites were simply incomplete. Thank you a thousand times! Thank you!! I finally removed it! I’ve never seen something this insidious on a Mac before. MalwareBytes wasn’t able to clean all of this mess up. Thanks to this page for the final piece of the puzzle. AFAIK I got everything. Note: change the fancy quotes to straight quotes in the terminal or you may end up with headaches. #2 Follow instructions on this page. Similar to many who have commented, this is the only thing that actually works. I had to follow all of the steps, and even though I didn’t find any sketchy Library files, checking to make sure of that is part of the process it seems. Seriously f weknow. I don’t have “profiles” in my System Preferences (older OS or something I guess), but the Terminal commands you gave seem to have done it. Finally banished this criminal malware, after trying so many other things that didn’t work! YES!!!!! at lasst a process that worked. Thank you many times. I did all step by stem, but problems were not solved completely yet on Safari. I re-installed OS, but still some problems. Cannot show menu tool bar in local language, even though system setting was appropriately done. Another problem is disable of password auto-fill function on Safari. For Google Chrome, everything is fine now after re-installation of OS and Chrome app. Step 5 worked! Thank you. Don’t type Instruction #9, just restart Chrome. Typo, not researt. 2019 February 17th- after getting the WeKnow Malware (fake Search Engine) when i rushed through a FlashPlayer update Pop-Up…i Finally got rid of it following these Steps..Thanks to Serhat Kurt’s instructions here. Still can’t believe it worked using my very mediocre computer skills. OMG I’ve tried to get rid of this annoying thing for so long and finally it worked, thanks so much!!! Yes I followed the steps diligently and it worked. Thank you a million times. Weknow is quite an insidious malware. Aren’t some people really mean to their fellow humans. Still having problems getting rid of it form Chrome. Please help. Have a MacBook Air and am not that technical. Thanks! Thank you so much! This really helped!!! I tried this, and instead my AdminPrefs got deleted? I don’t know how to get them back? Thank you, also after you do all of those steps go back and make google ur search engine and remove Weknow.ac since it will still be there. thanks very much. finally got rid of it. Thank you! The Terminal commands were the key for me. I once deleted my “Profiles” Preference pane. Is there a way to remedy this? Thank you! I was able to save a teacher’s mac book and will be able to help others with this instruction. YES! This worked, finally. Grazie Mille!! I was able to remove it from chrome but not safari. Any further thoughts? It was hiding as MPlayerX this time! My only problem is that after following the instructions in step 5 for the Terminal commands, the search engine is finally gone but now my new tab page is an about blank page and not the standard new tab page for Chrome. I am just speechless with tears of joy in my eyes! I cannot thank you enough. For a relatively nontechnical person, this was an amazing gift to empower me to know that with the support of generous people like yourself, I can do it! Thank you immensely! It worked!!! Part number 5 was especially efficient for me, as the problem was only with Chrome. The 4 other points were not useful at all. Step 5 worked! Cut and paste exactly and it’s gone…after 6 months of trying different methods and using Safari. Thank you so much god bless you!! B. Considering the malware could have come through a fake Adobe flash player upgrade, is there anything to search for and delete on that end ? like delete Adobe Flash player and reinstall ? Finally – thank you for your help with this!